Time really flies so fast. It’s Christmas time once again in the city. Christmas is the day of the commemoration of the birth of Jesus Christ which is celebrated by billions of people all over the world. The world came or originated from the term Christ’s mass. Every city is decorated with colorful Christmas decorations. When I visited, Melbourne I saw some shops display colorful set up and designs. Animatronic show with lights and sound can be experienced here. Colorful lights and beautiful music are usually its components. There are some incorporated toys which are moving. 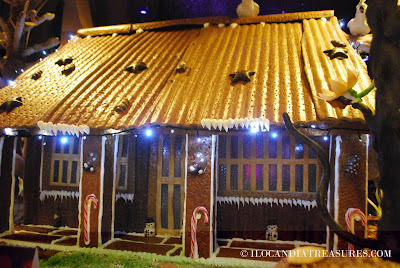 We also saw ginger bread built into a small house with other interesting candy decorations. 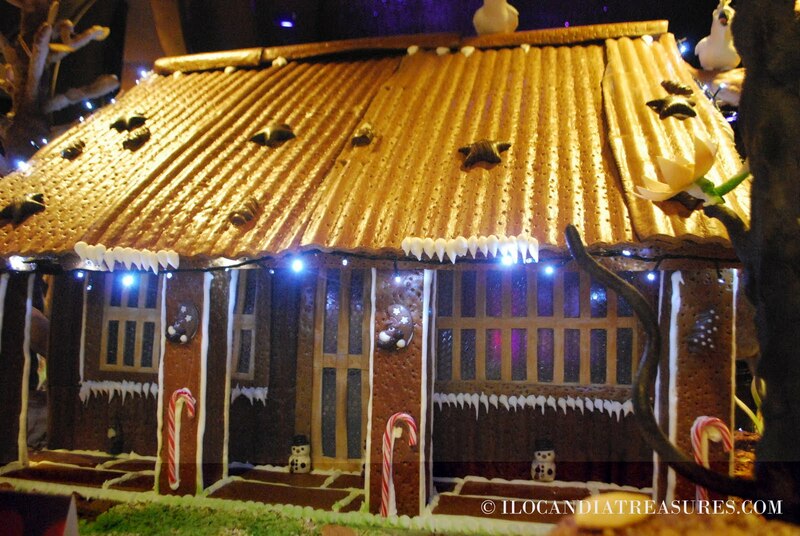 It is a German style where the breadhouse is similar to witch’s house encountered by Hansel and Gretel. Same is through when I visited Malacca which is located in a Muslim country. I saw Christmas trees with snow with mushrooms and smurf characters. I have seen another one in Baguio City. The alumni association, Ship for Southeast Asian Youth Program (SSEAYP) International Philippines (SIP), Inc., recently held its SIP National Awards ceremony during the Reunion on Board the Fuji Maru at Pier 13, Port of Manila. The awards committee aims to recognize alumni members who make exemplary contributions to the society. 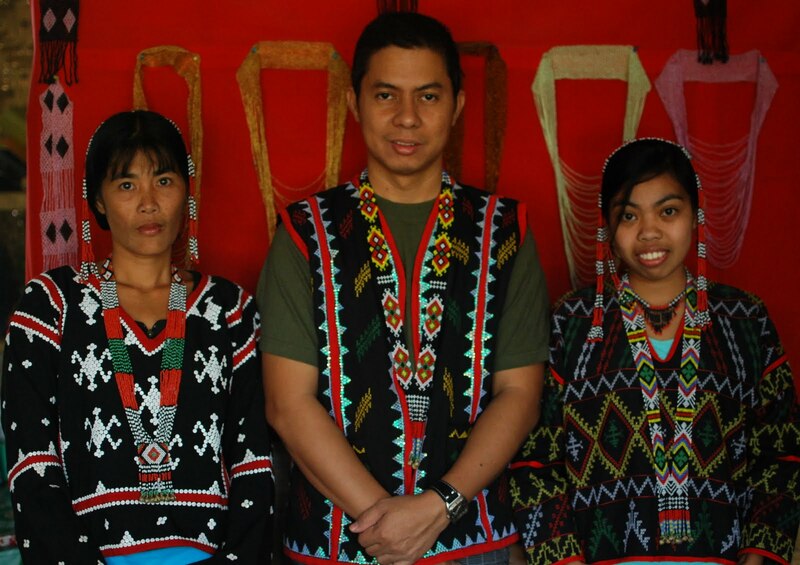 Our Awardee is the Secretary, Executive Council (Execon) National Committee on Northern Cultural Communities, Subcommission on Cultural Communities and Traditional Arts (SCCTA), NCCA until Dec 2013. Their activities include among others Capability Building Seminars/Policy Making for the Cultural Communities/Participation in Indigenous Peoples events and activities. 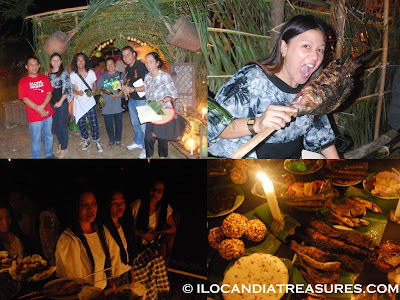 In this area, he has tapped blogging as a new media to reach more people in promoting the culture of Ilocandia. He is a cultural & travel blogger in the site www.ilocandiatreasures.com. 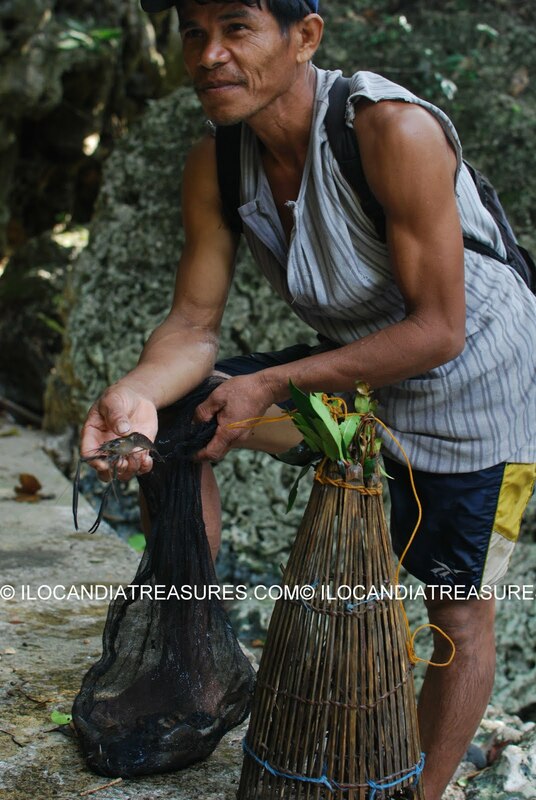 He is also the VICE-PRESIDENT, TAWID CULTURAL TROUPE – Ilocano cultural organization and presently, he is the PRESIDENT, THE ILOCANDIA PHOTOGRAPHIC SOCIETY (TIPS), INC. It will warm your heart to know that the awardee is also the proponent and founder of KIDS ON PROJECT PHOTOGRAPHY - a project that teaches cultural photography to kids in the orphanages. The award was handed in by SIP Board Chairman Yvette Ledesma and President Greg Alcera. I am so grateful to the screening committee and the entire board for giving this award. It’s a validation of my efforts to promote the Philippine culture especially indigenous arts and culture. Other awardees are Wilfredo Vina Bautista for Community Service, Atty. Mark Borres for Youth Empowerment, Napoleon Hernandez for Government Service and Atty Datu Reza Sinsuat for Strengthening SSEAYP. 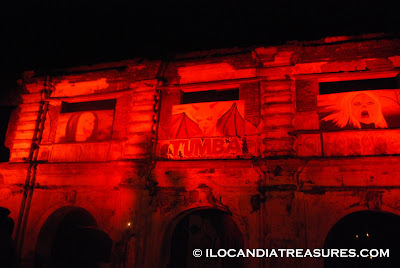 The fun and excitement never fade each time I attend the Tumba, a halloween tradition in the town of Paoay in Ilocos Norte. This is my fourth time to see it and my second time to judge the competition and I kept on discovering new things. Tumba means catafalque. 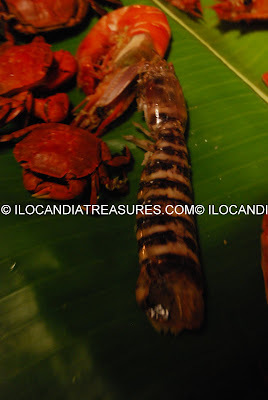 It is made of cogon, bamboo, coconut and banana leaves and other indigenous materials. It usually measures around 4x5x6 m. The people prepare an altar filled with a wide array of food plus antique images of saints, small and big alike, crucifixion, candles and flowers. The old folks clad in their pandiling and kimona with black or white veils recite prayers. They also render songs. 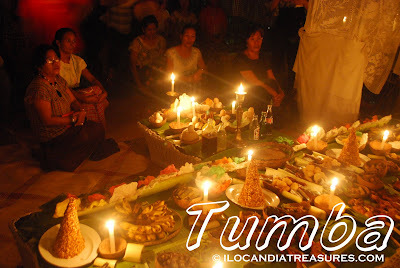 Tumba is celebrated every first day of November in time for the All Saint’s Day. The people from the community help put up the tumba. It used to be an individual barangay showcase but it was a long and tiring job to visit all the villages. So they came up with clusters of barangays or districts to minimize time and expenses. There were ten entries this year. We started past 7pm to go around. 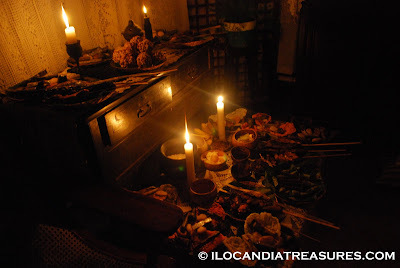 We have seen tumba that were dim lighted with only candles and torches. People in the community warmly greeted guests and they were led to the altar. Atang or food offering was shown to us. We were asked to pick whatever we like. The essence of tumba celebration is snatching the food you like from the table or it’s locally called mangararwa. I had a great time tasting the food they prepare from each tumba. They had the umras consisted of native food delicacies such as suman, tupig, linapet, patopat, baduya, bicho-bicho and many others. Drinks composed of a bottle of softdrink, beer and basi, a local wine made of sugar cane are also offered. Not to forget the important offering, the betel nut, gawed leaves and the lime for mamaen. I enjoyed eating the grilled fish such as the huge tilapia from Paoay Lake. 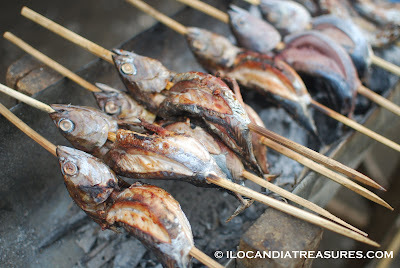 They also had the mudfish, catfish and the porong. They displayed also roasted native chicken, a farm produce in each barangay. People from the coastal areas showcased seafoods such as big crabs, shrimps, shell fish. 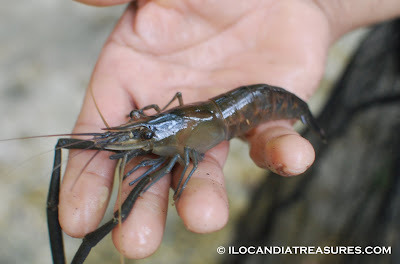 I even their exotic roach of the sea which is a family of shrimps. 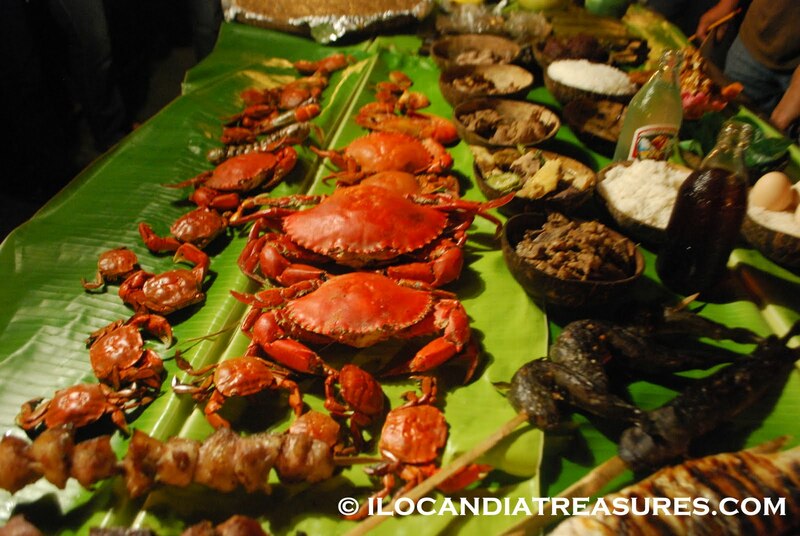 Fruits adorn the table in the tumba such as bananas, papayas, guaples, pineapples, sugar cane and other fruits. When you look up, some pomelos were hanged for decoration and I was told that that was the main decoration in the old times. 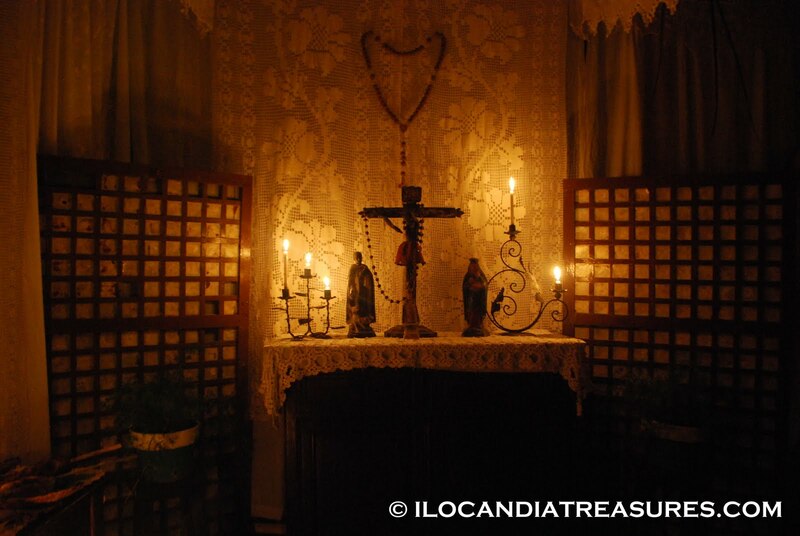 It was also decorated with abel cloth and crocheted fabrics including the altar. We finished it after an hour and a half. We had difficulty of taking home the bunchful food they have given to us. Right after judging the village folk shared the offerings. With Mr. Raquel, Ms Majang, Mrs Carpio and Mr Galano, we concluded our trip to the tumbas at the municipyo. Districts 5, 8 and 2 came out as the winners in this year’s Tumba. Frolicking did not stop at the tumba but went for a quick trip to the horror house set up at the creepy site of the convent ruins. There was a long queue of young people who want to be frigthened by scary characters inside. Screaming and shouting of young girls is what you can hear and there was even crying of a young boy. What a wonderful way to celebrate halloween. 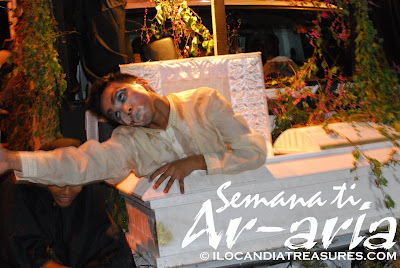 Ar-aria means ghost in Ilocano and the past week was a season of ghosts. 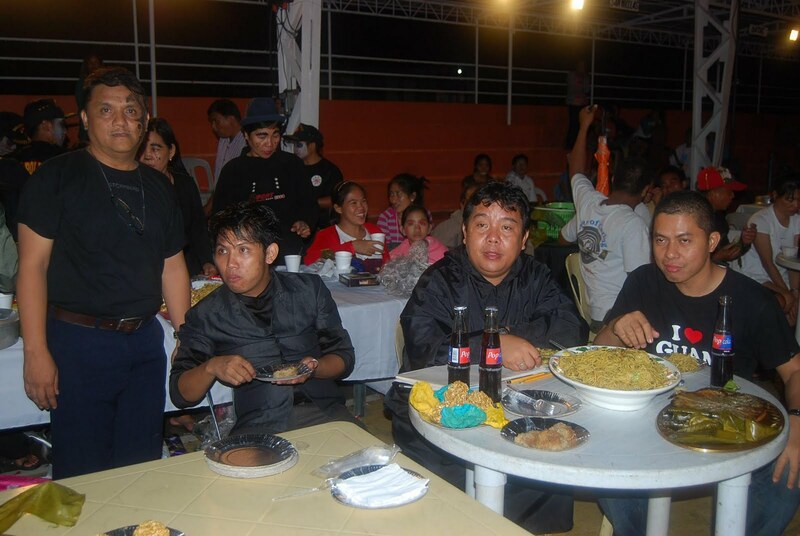 On October 30, I was invited by barangay chairman Joegie Jimenez to attend the celebration of halloween and judge the contests in the town of Burgos. It rained cats and dogs but it did not dampen their mood. Locals joined in the body painting contest, scariest costume, thriller dance, & lie down in a coffin challenge. The teenagers showed no fear of lying down the coffin. No elders dare tried it. There were some snacks basically of kakanin prepared for the participants and guests. 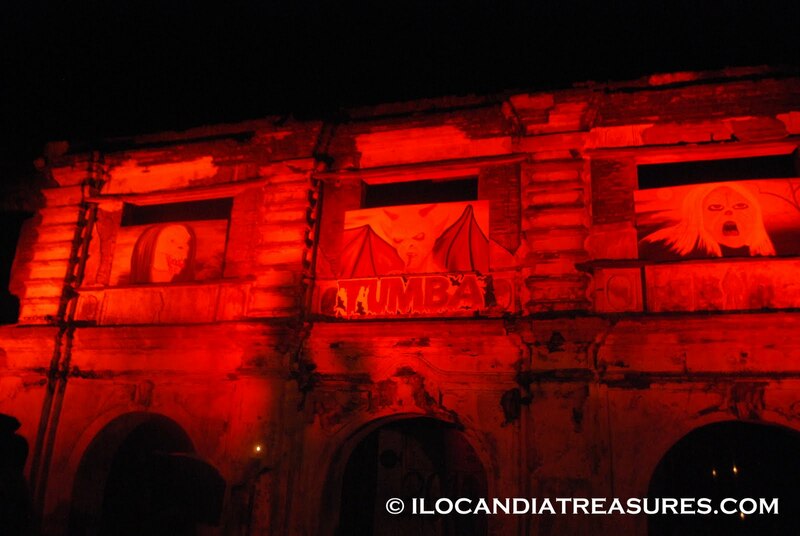 On October 31, a halloween bash at the Ilocos Norte Capitol was held. It was participated in by most of the towns in the province. Even local political leaders donned costumes. There was a parade of scary halloween characters and costumes that started from the public cemetery taking the Rizal Street and ending up at the Capitol. There were a lot of spectators for this event showing that they love to be scared. After the parade, there was a frightening pageant called Reyna Iloca-locana with most of them outrageous gay characters. They were made up really as creepy creatures. There was even one candidate who portrayed as unborn fetus who drank blood. There were also some halloween games such as the lungon challenge. Prior to this event, there was free horror film festival held at Robinson’s Mall and Mariano Marcos State University in which I saw the indie films Yanggaw and Kinatay courtesy of Film Development Council of the Philippines and the Provincial Government of Ilocos Norte. Since I was already in South Cotabato and I’ve been hearing Sarangani from Congressman Manny Pacquaio which he represents in the House of Congress, I compeled myself to drop by. I took a jeeney ride from General Santos City to the capital town of Alabel and I went straight to the Ladol Beach by hiring a tricycle. On my way to the bay I passed by a house which grills fish for sale. 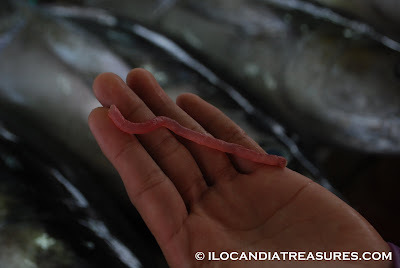 I was tempted to eat because I know that the fish are fresh straight from the sea. I ordered tinap-anan fish for only 15 pesos each and ordered rice to complete my meal. I enjoyed eating and then later went to the shore. I saw so many fishing boats at the bank. I saw some people fishing and making a net. Some young boys were playing a local game at the houses nearby the shore. 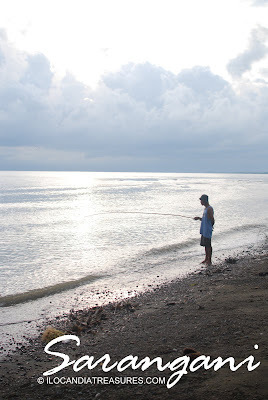 It was quite simple life to live in Sarangani. 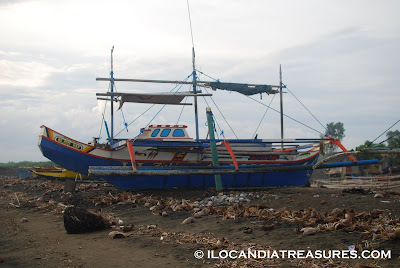 Sarangani Bay is in Sarangani province which became independent in the year 1992. 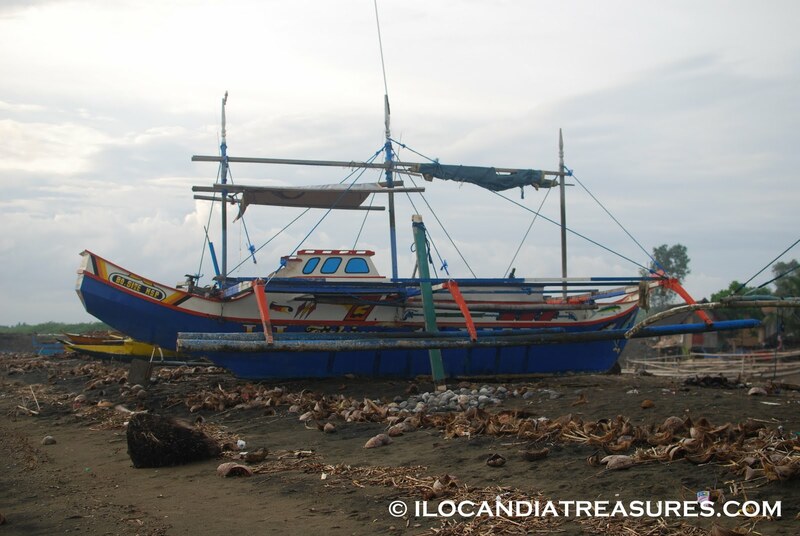 It belongs to the SOCCSKSARGEN or Region XII of the Philippines. 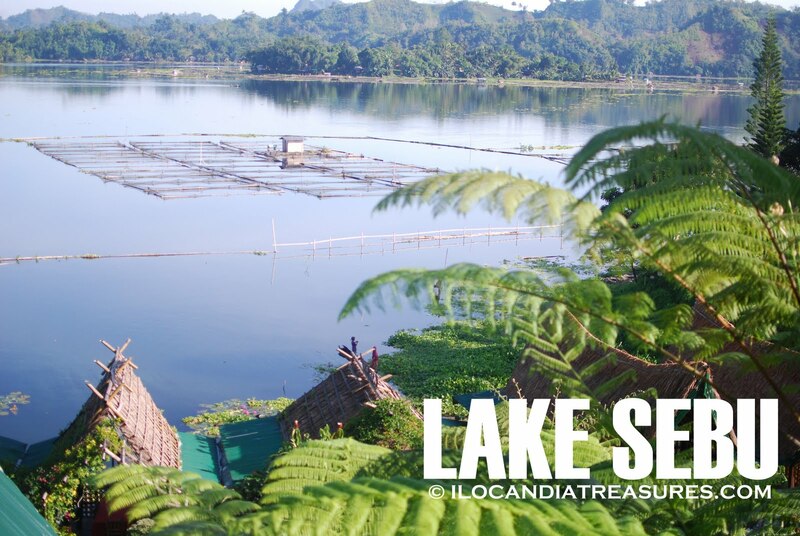 It is an acronym that represents South Cotabato, Cotabato, Sultan Kudarat, Sarangani and General Santos City. Sarangani has an area of 2, 890 sq. km with seven municipalities. 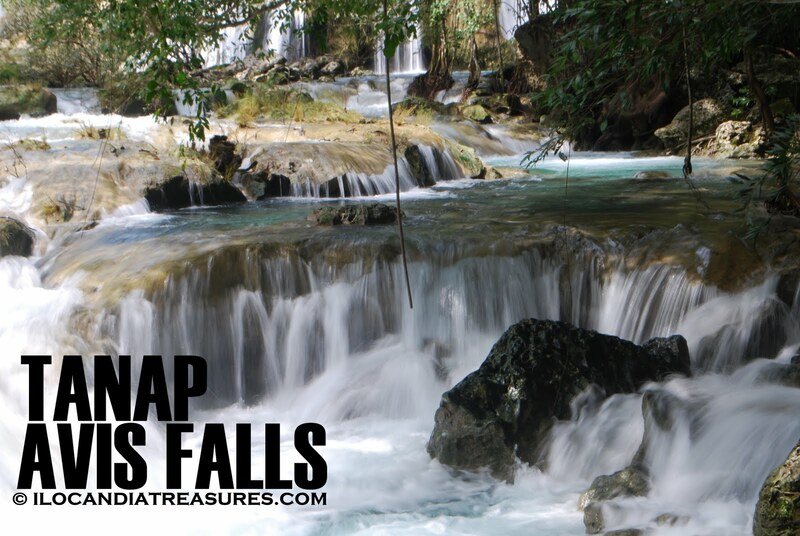 It boasts of eco-tourism adventures such as white water tubing at the rapids of Pangi river in New La Union. White sand beach of Gumasa comes alive during the Sarangani Bay Festival on May. 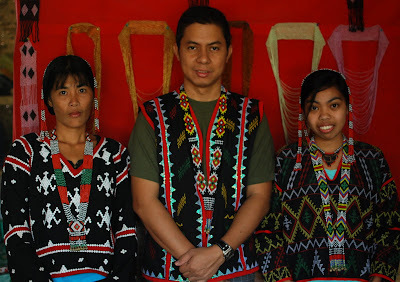 Sarangani is also home to several ethnic groups that give a colorful culture. On my recent visit to Kuala Lumpur, I saw some shops display colorful decorations at their entrance hall. I was taken around by my Malaysian friend Izan at the KL Sentral and one by one that I saw these colorful designs. hese designs are called rangoli. It is also called alpana. It is a decorative folk art of India. These designs are traditionally made on floors of the living rooms and courtyard of homes of Indians which signify the sacred welcoming for the Hindu dieties. This is not only for decoration but it is believed to bring good luck. It is a symbol of religious and cultural beliefs. It is an important part of the spiritual process. Its basic color is white and it is dyed with different colors to create attractive and wonderful multi-colored designs. This is traditionally done by women. I also saw simple decorations in Trichy in North India where it is hand-drawn by chalk at the doorsteps of the business establishments. They can wash it off with water to change and make another design. They make designs out of their traditions, folklore and practices and it varies from one place to another. 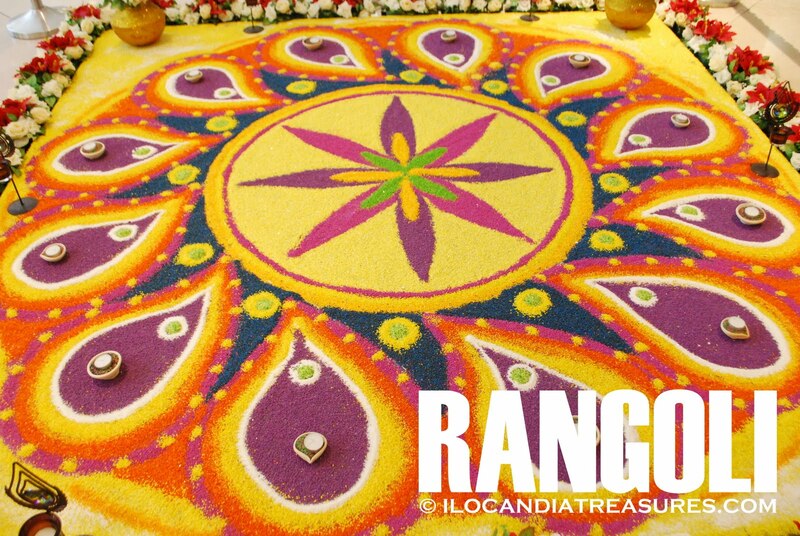 This is also observed during festivals, marriages, and milestone events. 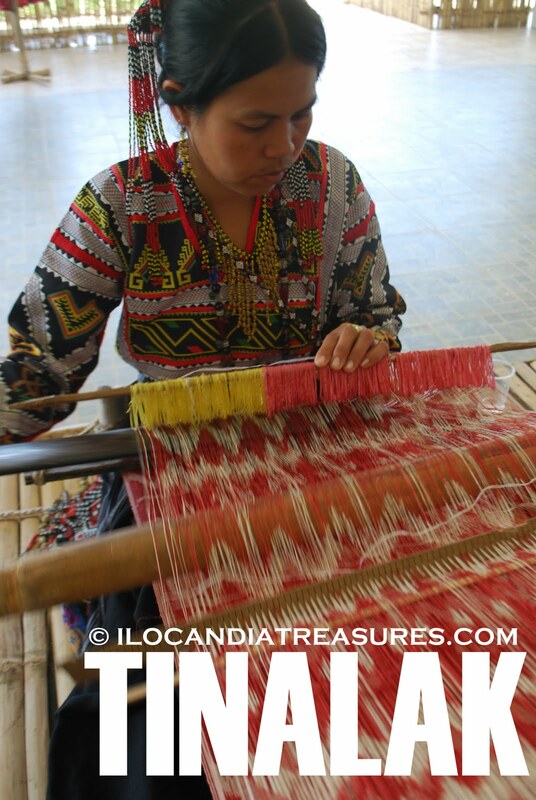 T’nalak or tinalak is a hand-woven textile made from the abaca plant. 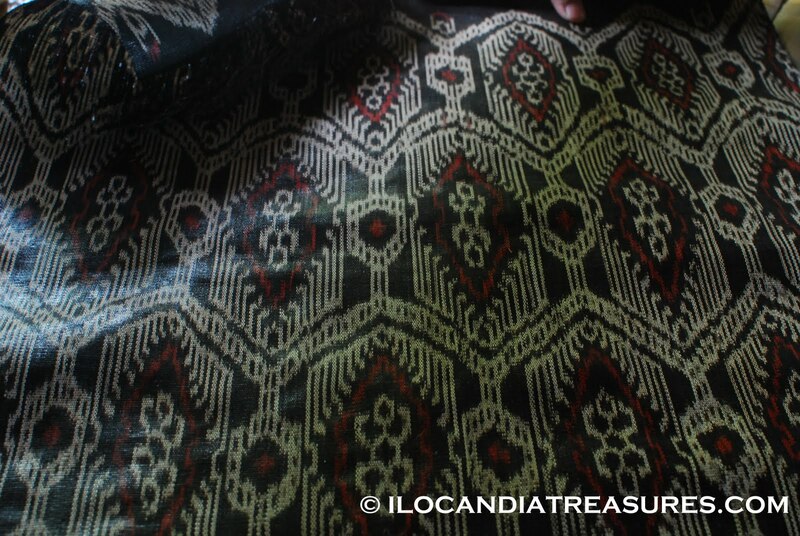 This is a traditional tapestry by the ethnic group called T’bolis in South Cotabato in Mindanao. This cloth does not only serve as a decorative material but it expresses the warm welcome and honour to guests and signifies the status of the owner. On my visit to Lake Sebu, I really made it appoint to see the weaving of tinalak. 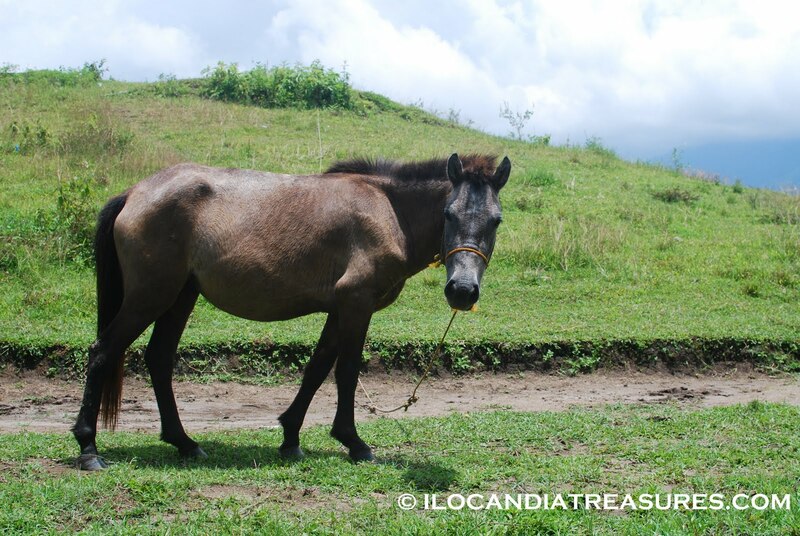 I was informed by the locals that I should go and visit Lang Dulay. They put up a center for the tinalak weaving where guests can drop by to see it. By the time I went there I met people from the National Commission for Culture and the Arts (NCCA). 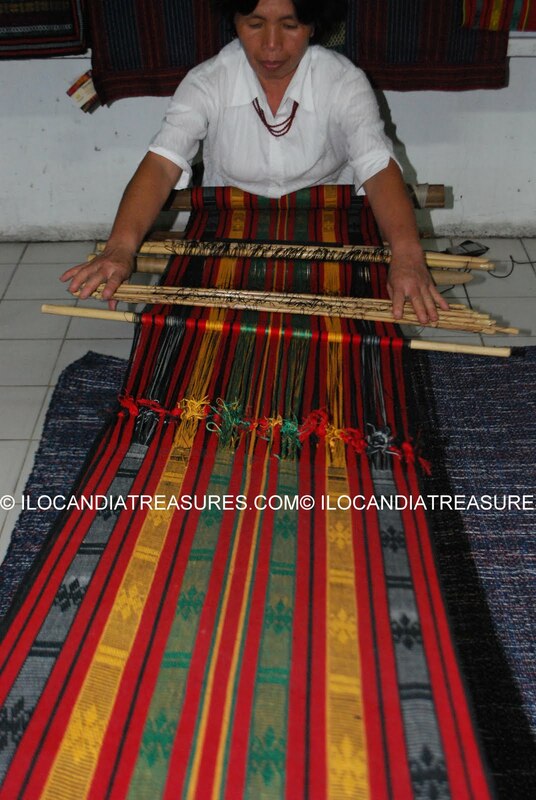 They were documenting the step by step process of the weaving. I was so fortunate to have met Lang Dulay who was declared as National Living Treasure or Manlilikha ng Bayan Awardee by NCCA. 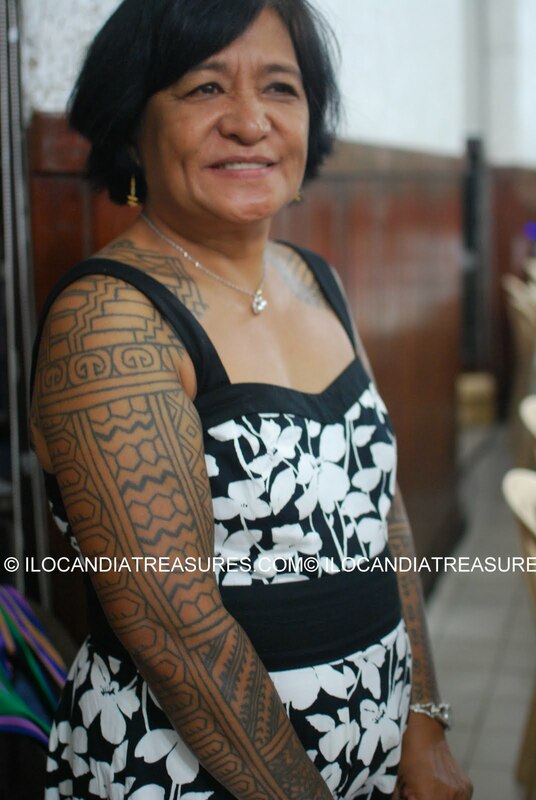 She is already old and one of her duties and responsibilities as an awardee is to teach her craft. There were several women helping each other weave. Some were her grandchildren. The weavers only use vegetable dyes and pigments from roots and barks of trees that will give that color to the tinalak. As it maybe observed that there are complex patterns designed in the tinalak and requires good skill in weaving techniques. One meter of tinalak textile takes about months to finish. They also call themselves as dreamweavers because they work without preliminary designs but create their designs from their dreams and from patterns handed down to them. I had an encounter of another tinalak weaving in Tagum where the T’bolis participated in the Indigenous Peoples’ Month celebration. 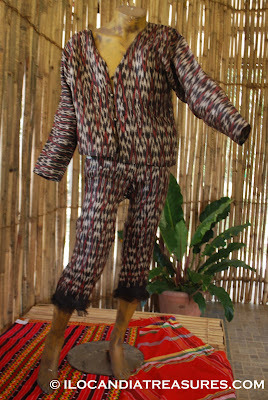 They showcased some of the tailor-made polos, chalecos and pants made from tinalak cloth. There were also items such as bags and wallets exhibited made from this textile. 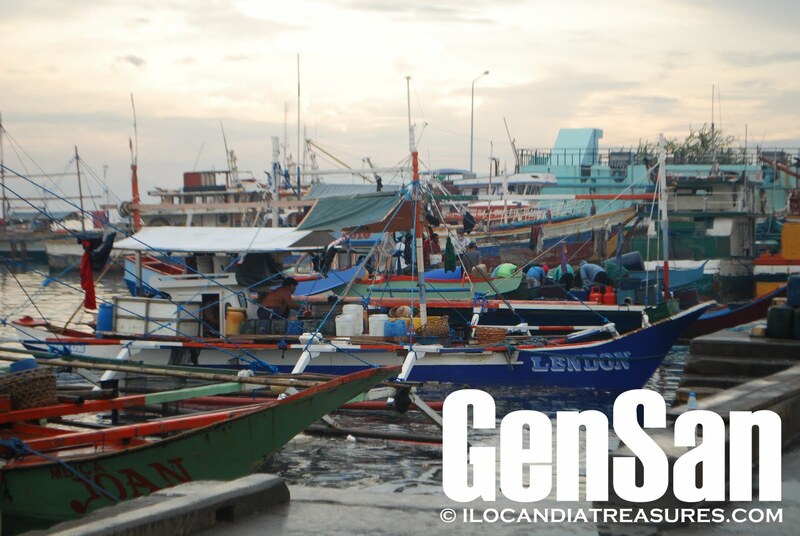 Its truly a prized cloth for its versatility and it is being featured in the new 1,000 peso bill. 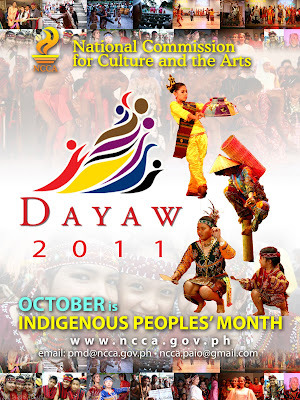 The month of October is declared as National Indigenous Peoples’ Month as per Presidential Proclamation 1906. In celebration of this, the National Commission for Culture and the Arts is sponsoring a festival celebraton called Dayaw 2011. It is under the auspices of the Subcommission on Cultural Communities and Traditional Arts (SCCTA) and Mindanawon Foundation. This festival aims to celebrate the richness of the cultures of the Filipino people and to strengthen the awareness, appreciation and pride of all Filipinos of our own traditional culture. It has this year’s theme: “Paghabi ng Ating Pagkakatulad Tungo sa Kapayapaan”. Various activities will be conducted such as rituals and performances, food festival, forum, arts and crafts exhibit and traditional games. 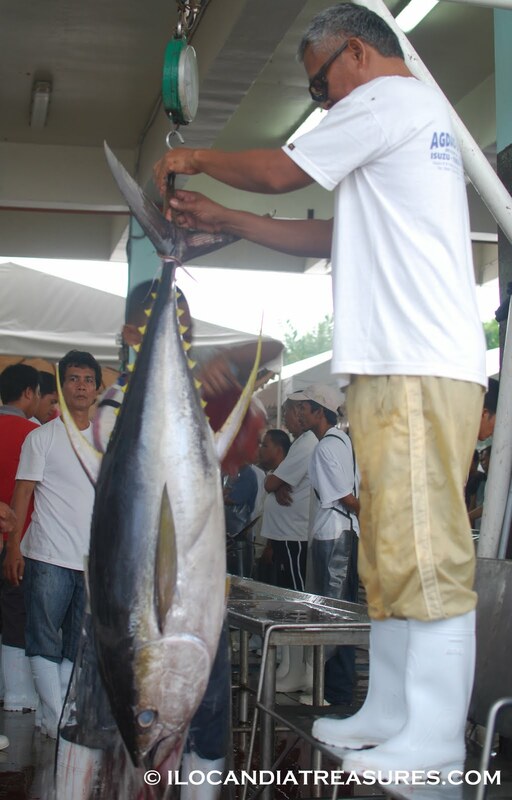 It will be held on October 6-10, 2011 at the Energy Park in Tagum City, Davao Del Norte. On September 16, after our regular meeting in our committee at National Commission for Culture and the Arts, we were invited to attend the Indigenous Peoples Regional Assembly. It was convened by Senator Loren Legarda at the Teacher’s Camp in Baguio City in partnership with other government agencies namely: National Commission for Indigenous Peoples, Department of Education, National Commission for Culture and the Arts, Department of Tourism, Department of Environment and Natural Resources and the International Labour Organization. 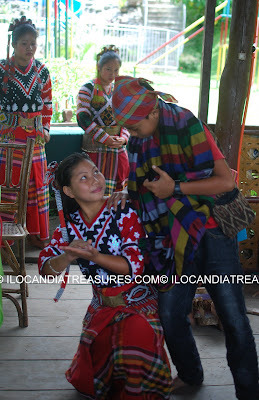 This affair was participated in by Indigenous Peoples from Luzon covering Regions 1-5 and the Cordillera Region. 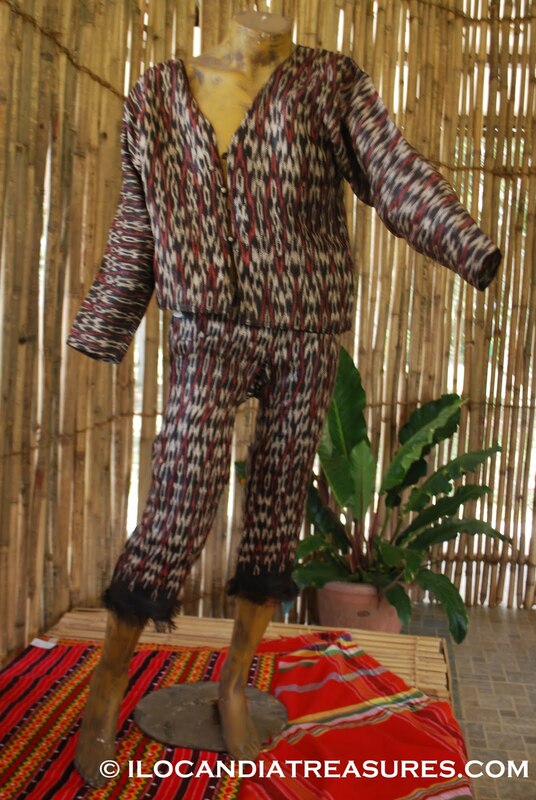 There was Indigenous Peoples products exhibit at the venue featuring the loom weaving of textiles. A film featuring Buhos was also shown to the delegation. There were lectures presented at the plenary session with topics Climate Change and its impacts on Indigenous Peoples, Reducing Emissions from Deforestation and Forest Degradation Programme and Disaster Risk Reducton: Use of Geohazards Information. It was followed by Q and A which focuses on mining. It was pointed out that some members of the IP community have the tendency to be bribed to allow mining in their areas. It was emphasized that if they said no to mining then they should solidly stand for it. There were cultural performances presented during the Solidarity Night. Unity Dance was performed by the NIIT-Baguio and “Tayao” was presented by Benguet delegates. Some dances were joined by the public. Nose flute was even played by one of the performers. An Aeta woman rendered a song. I also met a woman from Kalinga who has tattoe on her body. It is called batok which signifies beauty among locals. Local wines and cocktail foods were served. Later, we were treated for a dinner with pinikpikan. We had fun attending the event. Regional assemblies will follow in Visayas and Mindanao. I don’t usually watch animations but because of their popularity, I encounter them often on posters and on the internet. I don’t have interest on them since they are for kids only. 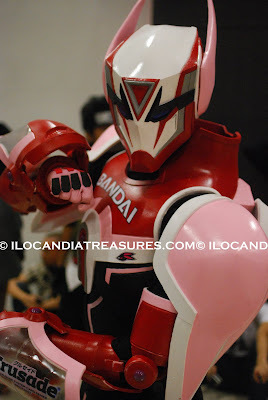 But on my recent visit to SMX Convention Center in Pasay City, I saw a lot of people youngsters at that on cosplay. There was actually a convention for cosplay. I see people take photographs with them. I did have photo ops with them too. When you get closer to them, the animated character tends to get into life. It somewhat gives you surreal scenario. So when I saw them one by one, it excited me. I kept on shooting them for they were enjoyable to be photographed since they are skilled to strike a pose. 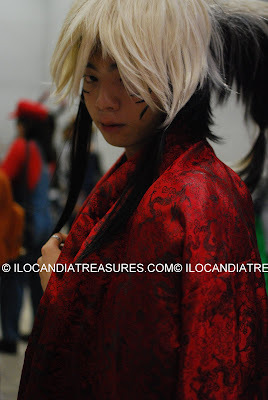 The costumes were so colorful and even the hair were of differenct colors. All of the models were so cooperative and enjoyed the party as well. I simply enjoyed my very first experience of cosplay. It is a contracted word for costume play. It was coined by Noboyuki Takahahsi of Japan. Cosplay is a type of performance art. Participants wore costumes and accessories that create a specific character. Animated characters from Japan are very popular. The characters are being sourced from the anime and manga. Last Sunday, my colleague Alaric Yanos and I went to the beautifulTanap Avis Falls in the town of Burgos in Ilocos Norte. We have planned it for a long time but there was little water in there as reported by our source. However our visit was a good timing since the water was huge attibuted to the rains in the last storm that hit the province. We took the GMW bus early at half past 5 in the morning then arrived after an hour. We took a tricycle going to Brgy Tanap. The regular fare is 50 pesos one way. Our ride had to cross river water and rough road. Then the driver pointed us which path to take. It was so accessible that you just have to follow the easy trail and youll be walking along an irrigation canal. It was cool to be there before 7am. We saw various plants and insects. We saw the colorful centipedes along the way. We saw big dragonflies of red and black colors. When we were approaching, we can hear the beautiful sound of rushing water. It was so awesome to see and watch the waterfalls. There were deep basins of water, huge rocks and stones. We saw some butterflies flying over the waters. I saw a group of white butterflies and another batch of yellow butterflies. They land on a part of the water and obviously zip water. Macrophotography is so applicable to the site since there were lots of small creatures that can be used as subjects. 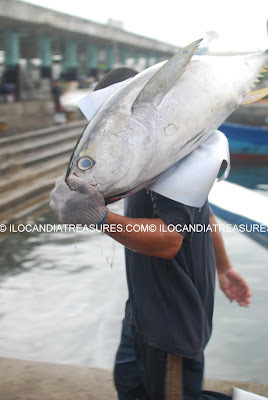 A few minutes when we arrived we saw a fisherman who harvests from the tiny fish cage traps that he installed in strategic locations. He caught some fresh shrimps and looks so yummy. 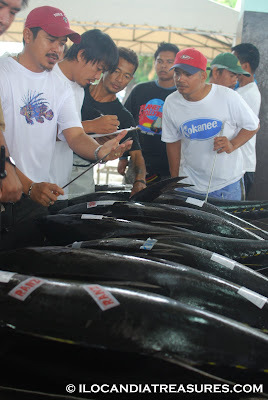 We interviewed him for a while as he explains how he does fishing. We walked further and we reached the second layer of the waterfalls. I took a dip and enjoyed the fresh, clean and cool water. It was like having a jacuzi where the pressure of the falls massaged my body parts. 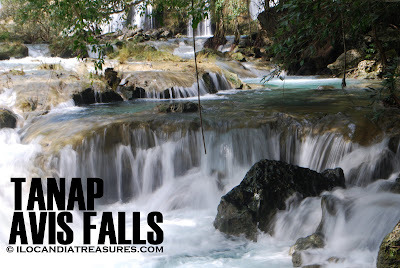 I climbed and explored the waterfalls on the top area and there I saw the river that flow continuously. We were told that it was the only second layer and the last layer was still to be found farther and with difficulty. Anyways, we can still come back to explore some more of this waterfalls. I hope to be back to commune with nature and appreciate its value and be more responsive to protect the environment. Truly a dazzling waterfalls.